The nation's most popular seafood is unfortunately rife with food fraud, according to nonprofit group Oceana's DNA tests. If you love shrimp in America, you’re not alone. Shrimp is by far the nation’s most popular seafood. Unfortunately, it turns out that your shrimp may be lying to you, according to a new report just released from Oceana, a nonprofit dedicated to ocean conservation and advocacy. 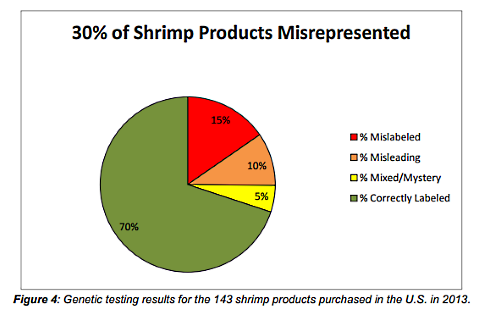 Oceana performed DNA testing on 143 different shrimp products purchased at 111 different grocery stores and restaurants. Of these, 30% were misrepresented by their labels. 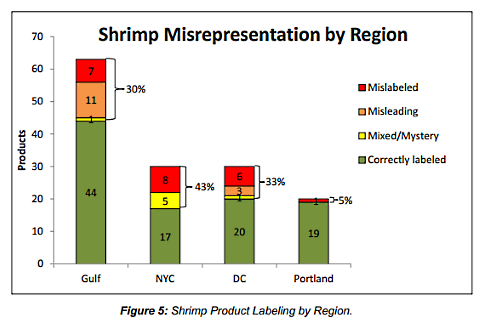 Not all the news was bad news, depending on region: apparently, if you live in Portland, OR, only 5% of shrimp are misrepresented. That’s way down from every other region that Oceana tested. Where was the highest level of shrimp subterfuge determined? NYC, where a whopping 43% of shrimp were deemed fraudulent. So if these shrimp aren’t what they say on the package, what are they really? Lots of things, apparently. 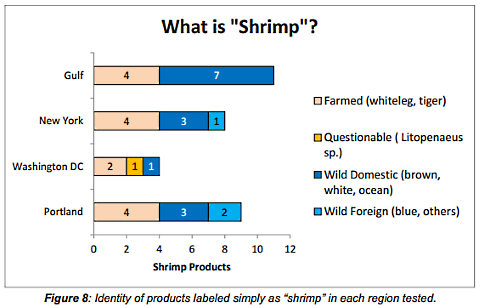 The most telling thing Oceana discovered was that farmed whiteleg shrimp is most often sold as “wild” or “Gulf” shrimp. If you love shrimp and have time to read the report, but don’t want to download the PDF, the Times-Picayune has helpfully made the entire thing available for viewing here. Forty percent of the 20 shrimp species and categories collected and identified in the course of this study were not previously known to be sold in the U.S.
A full 30% of over 400 shrimp products surveyed in grocery stores alone lacked country-of-origin info, while 29% lacked farmed/wild info and one out of five provided neither type of info. What about those mystery shrimp packages that simply call themselves “shrimp”? 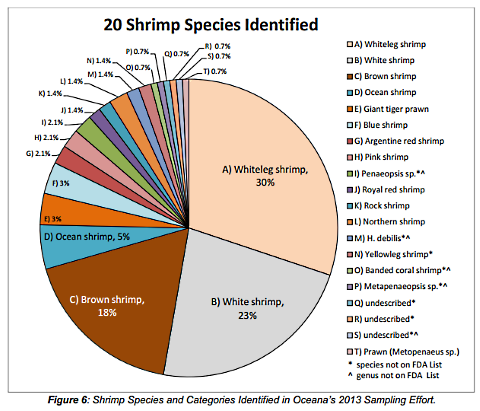 Oceana found that over half of species labeled simply as “shrimp” were actually wild-caught. We say, maybe it’s time to rethink that shrimp addiction we all have. We love shrimp, but we also like knowing what we’re actually putting in our mouths. And we definitely don’t want to accidentally be supporting slave labor.